Since it’s introduction to the small pickup segment, the Tacoma has become a staple in the Toyota brand and pickup world, in general. Few pickups have enjoyed the longevity of being on top as well as the impeccable ability to retain its resale value as the Tacoma has. With past and present experience to prove that it’s just as strong today as it was yesterday, a used Toyota Tacoma is a great buy, no matter the year. In NH, there is nowhere else to look for the biggest selection of used Toyota Tacomas. Having made its way to the midsize pickup segment, Tacoma’s are still the fastest growing pickup on the market today. As the winter season comes upon us, there’s no better four-wheel drive pickup to get yourself into. As a certified Toyota dealership, Rochester Toyota is qualified to sell new and used Toyotas as Certified Pre-owned. Their friendly and educated staff is there to guide you along the process of choosing the perfect Toyota for your needs. Given the approaching winter season, there is no one more qualified to put you into your next four-wheel-drive Tacoma than the local NH natives at Rochester Toyota. Understanding the inclimate weather we are prone to in New England, Rochester’s employees can empathize with your needs and put you in the exact car that will guarantee safe winter driving for you and your family. 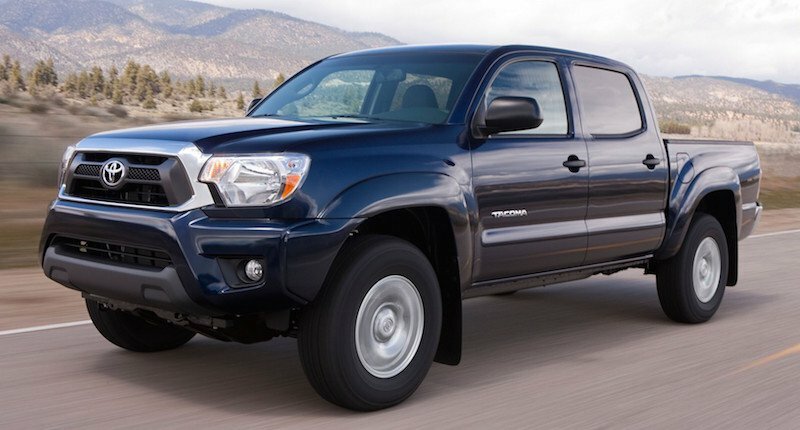 Even though Rochester Toyota has the largest selection in the region of used Tacoma’s, the 2012 year is specifically a great model to consider. The 2012 Tacoma belonged to the the 8th generation and received some major improvements for this model year. Celebrated for its updates, let’s take a closer look at what still makes the 2012 Tacoma a great buy! Even though it’s only been a couple years since 2012, the economy hasn’t changed so drastically that we’re no longer a market of budget friendly buyers. In fact, one of the Tacoma’s great strengths is appealing to the full-size market in mid-size price range. Of course, it is not a full-size pickup, but the workload capacity is very comparative to its full-size competitors and one look at the price tag makes full-size buyers second guess their gas gulping full-size choices. The Tacoma also has its competitors beat when it comes to price and fuel economy, which in today’s economic climate still plays a very big role. And let’s face it, while we all love the feeling of looking down on traffic from way up high in your huge pickup truck, the Tacoma still offers that tall feeling, just in a midsize pickup making it easier to park in tight spaces and zoom along in traffic. For its model year, the 2012 Tacoma led its class in technology, introducing Toyota’s Entune services. Including items we may now take for granted, but still are highly sought after amenities, Toyota’s Entune includes services like Bluetooth phone and audio connectivity, HD radio, satellite radio, voice recognition and demands, iHeartRadio streaming, and real-time traffic info. Offering two different engines that work specifically to job at hand, a choice of rear and four wheel drive are also available. If you’re not one who’s going to be hauling a heap load of plywood or trailering boats or horses to and from shows, then the 2.7 4-cylinder engine will be a safe bet for you. Producing 159 horsepower with 180 lb/ft of torque, this engine is going to give you 19 city mpg and 24 highway mpg when in 2WD and slightly better in a 4WD of 18/21 mpg. The second choice of 4.0L V6 is probably going to be the better choice, even if you’re not doing a crazy amount of towing or hauling. Because its fuel economy is so tremendously different (the V6 gets combined 19 mpg in 2WD and 18 in 4WD) where you’ll notice the difference is in its pickup and power. Putting out 236 horsepower, which is significantly higher than 159 hp on the 4 cylinder, and 266 lb/ft of torque, the V6 comes standard on the 4WD Double Cab and X-Runner but is available on the Access Cab and PreRunner Double Cab. The 2012 Tacoma offered three configurations, a 2-door Regular Cab, a 4-door Access Cab with jump seats in the back and rear-hinged rear doors, and a 4-door Double Cab with a full-width back seat and four conventional doors. All above configurations are available in 2WD or 4WD. Coming standard in the base Regular Cab is air conditioning, 4-wheel anti-lock brakes, rear differential, full carpeting and a tilt-telescopic steering wheel. Cloth bench seat, which is nostalgic gold, 4-speaker AM/FM/CD radio, dual 12 volt outlets and three cupholders round out the improvements to the interior cabin. 2WD runs on 15-inch steel wheels while 4WD roll on 16-inch steel rims. As the next available configuration, the Access Cab includes a bit more in terms of what’s expected in higher trims: power door locks, windows, overhead console. Cloth bucket seats replace the bench seating while a floor console and rear jump seats add the flavor. The Double Cab adds an adjustable lumbar driver’s seat, 60/40-split rear bench with under-the-seat storage, and rear bulkhead storage. Capturing the growing audience of youths who have been Tacoma consumers for years, a subwoofer, SiriusXM Radio, Bluetooth, power mirrors, mud guards and fender flares round out its flare, which if you don’t mind, we’d rather not talk about. As a 2WD sports truck, the X-Runner has lowered access to the cab. It comes with a 4.0L V6 6-speed manual powertrain. 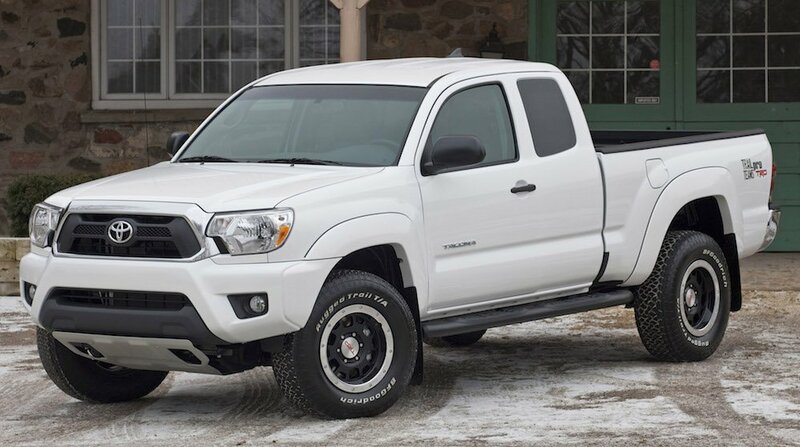 Bilstein shocks, summer tires, a limited slip differential, big-diameter brakes, a hood scoop and fog lamps ensure this Tacoma can be taken anywhere and stand up to the elements. Sports seats, remote keyless entry, a leather-wrapped steering wheel and shifter as well as backup camera bring the luxury up to a level that feels comfortable and inviting. It’s monochromatic body trim is stylized in a way that is unusual but welcomed fit for the 2012 Tacoma. A TRD Supercharger is optional. Another 2WD-only model, the PreRunner offers two engine choices: 4 cylinder and V6. It also comes in the Access Cab or Double Cab styles. Merging the ride height and tough off-road looks of the 4WD models with the mechanical simplicity, lighter weight and lower cost of a 2WD drivetrain. The next level up, SR5 displays such features as a sliding rear window, chrome grille surround and rear bumper along with a color-keyed front bumper. Wheel flares, cruise control, remote keyless entry, variable wipers, backup camera and leather wrapped steering wheel and shifter complete the style and interior updates. The TRD Off-Road package and the TRD Sport Package are only available in V6 models. The TRD Sport Package offers bucket seats, an overhead console, leather wrapped steering wheel, fog lamps and a 115-volt/400 watt bed-mounted power point. Contributing to the unbridled display bada**ery is a hood scoop, a sport-tuned chassis with Bilstein shocks, and limited slip differential and all season tires on alloy wheels. The TRD Off-Road contains a locking rear differential, skid plates, 265/70R16 mud and snow tires, alloy wheels and off-road suspension with hill-start assist and Downhill Assist Control. Taking advantage of Rochester’s leading Toyota dealer means tapping into the best in new and used Toyota models as well as exceptional service from their team of trained technicians. As a certified Toyota dealer, you can rest easy knowing that genuine Toyota parts are being used in all the repairs and servicing of your new Toyota.